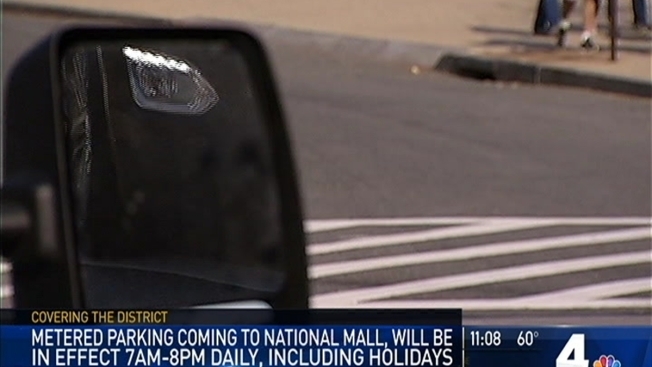 Getting free street parking and free spots in parking lots along the National Mall will soon be a thing of the past. Those spaces will soon be metered, according to a spokesman for the National Park Service. The parking spots affected are currently free but will soon cost $2 an hour from 7 a.m. to 8 p.m. daily. Installation of meters will begin May 1, with payment enforcement scheduled to begin June 12 from 7 a.m. to 8 p.m. daily, including weekends and holidays. Pay stations will accept credit cards and debit cards. Payments can also be made on the Parkmobile app or website. The NPS plans to have 90 parking pay stations installed for an estimated 1,100 spots, said NPS chief of communications Mike Litterst. No additional spots will be added to the area, but existing spots will now be metered, Litterst said. D.C.'s Department of Public Works will enforce the parking regulations. The NPS said it hopes the change will increase turnover of the area's limited parking, encourage visitors to use public transportation and provide revenue to create affordable visitor transportation, according to a statement released Friday. These will be the first and only parking meters in D.C. that will charge for parking 365 days per year, a DPW representative said.